NVH athletes have been taking part in a number of events over the last week or so. Here's an update from Barry Wane. 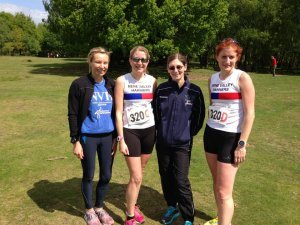 Nene Valley Harriers' veteran runners took centre stage last Saturday, in the British Masters Road Relays at Sutton Coldfield. Hot on the heels of winning the team prize at the Eye 10k the previous Sunday, the ladies team emerged with credit in the over 35 category. Laura Grimer ran the first leg of the 3 mile, undulating course in an excellent time of 20:15, which put the team in 19th position. Sophie Wilkinson posted 20:59 on the second leg, and was followed by Louise Blake and Melanie Tindale who ran the 3rd and 4th stages in times of 21:22 and 21:50 respectively. These times were good enough to move The Harriers up to a finishing position of 17th, out of the 35 participating Clubs. Nene Valley fielded a team in the men's over 45 age group, and they also enjoyed some success. Timothy Hunt got the city based club off to a good start, handing the baton over to David Neal after running a 19.25 leg. Neal followed this with an outstanding run, clocking a time of 16:25. He was well supported by Chris Mooney 17:45, and Sean Beard 17:01. The Nene Valley squad finished a highly respectful 12th out of 43 teams. Another Harrier in action at the weekend was 20 year old Lloyd Kempson, who took part in the prestigious Highgate Harriers 1500 metres open meeting. Much to his delight Kempson dipped under 4 minutes for the first time. His run of 3:59.70 was the fastest recorded by a Harrier, over the distance, for a number of years. The previous Wednesday several Nene Valley athletes made the short journey to St Ives, for a track and field meeting which incorporated the Cambridgeshire 3,000 Metres County Championship. A number of Harriers starred in this event, with Bethany Goymour claiming the bronze medal in the under 17 category in a time of 11:51. Although ineligible for the county championship Alex Hampson comfortably won the mens 3,000 metres in 8:51,and Jake Richardson finished 5th in 9:26. Stamford based Cat Foley was also inelligible for the county championship, which is open only to runners born or residing within Cambridgeshire. Despite this Foley finished 2nd in a time of 10:08. Her blisteringly fast final lap of 72 seconds left her just 1 second behind the race winner. Other Harriers to win on the night, included Sean Reidy in the 800 metres,and Kai Harrison, Lydia Church and Lucy Molyneaux in their respective shot put categories.